Archaeologists working in a planned construction area for the Israel Antiquities Authority have discovered more than 100 artifacts that were used in ancient pagan rituals. 3,500-year-old incense vessels and decorative ritual cups were found buried in a rock hollow. Professor Yossi Garfinkel of The Hebrew University of Jerusalem pointed out that holy articles were buried after their use rather than thrown out. “It is quite possible that these artifacts were used in the cultic area and in the temple and they accumulated, and when they ran out of space or they became old, a pit was made to bury them,” he said. Some of the vessels found at the site were from Cyprus and Mycenae, showing a ritualistic connection between Greece and Israel. 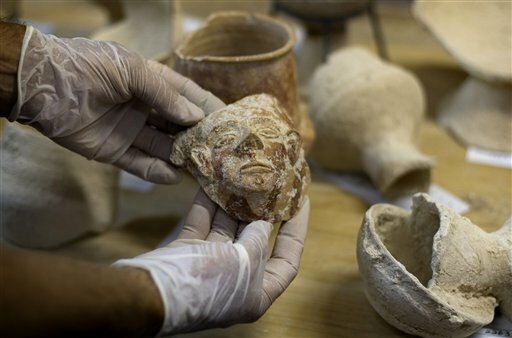 Israel’s Antiquities Authority has expressed plans to exhibit the findings within the next year. This entry was posted in Archaeology, Cyprus, Discoveries, Greece, Israel, Mycenae. Bookmark the permalink.